Alwin Komolong (4) with his national teammates during World Cup Qualifying. 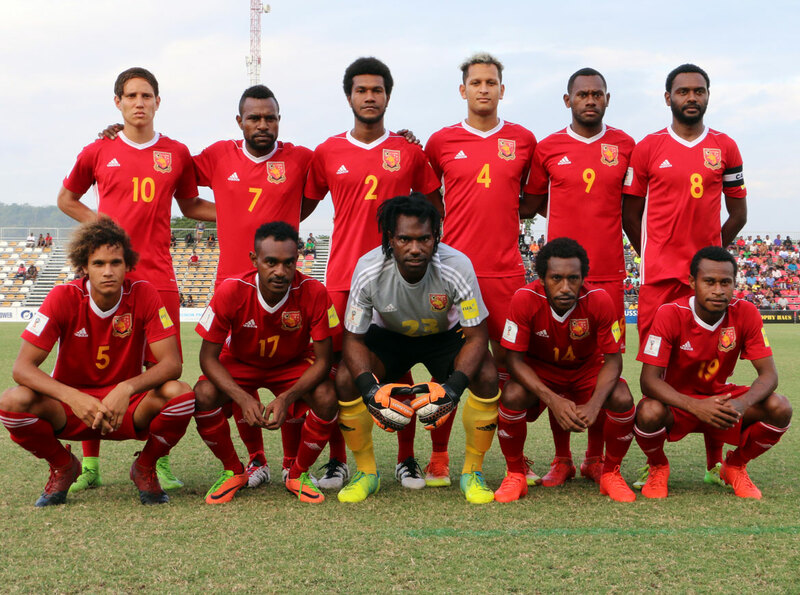 Alwin Komolong has been on the regional scene for over half a decade now although it wasn’t until a string of impressive performances with the U-23 and senior Papua New Guinea national teams that he was finally handed his big break. Not long after his graduation from Kentucky University the 23-year-old found himself winging his way to Germany to begin his professional career with Stuttgart Kickers. While the country wasn’t unfamiliar territory the environment of a professional club and lifestyle came as somewhat of a shock. “At the beginning I was alright because I was trying to impress everyone but as time wears on it has become more of a mental challenge,” he said. “It’s different to back home. It’s a professional environment which means there’s just more pressure with everything really. Football has given Komolong plenty of opportunities, even before he debuted for Papua New Guinea at the OFC U-17 Championship in 2011 but especially since, including stints in New Zealand and Germany, being the only Pacific Island player to appear at the FIFA Blue Stars Youth Tournament in Switzerland and earning a scholarship to attend university in the United States. However even with all that international experience he knew his development was lagging somewhat behind his teammates. “My coach here had already seen me before I came and I also knew him so that helped,” he said. “He didn’t really put much pressure on me because he knew I was coming from the Pacific, he knew that this year would likely be a learning phase, for me to get used to Germany – to the football, the culture of football. Although there was little pressure from above, Komolong said he put pressure on himself to adjust as quickly as possible to his new environment. “There wasn’t really pressure on me to be 100 per cent every game, but of course you want to there. Having had a couple of months to settle in, the nerves are starting to settle and Komolong is relaxing into life as a professional footballer. “Right now I feel confident, but if you asked me that three months ago I probably would have said that I felt like I was still on trial and under pressure. “That also comes with the realisation that it’s a job, it’s a day-to-day thing. I’m pretty happy with where I am at.